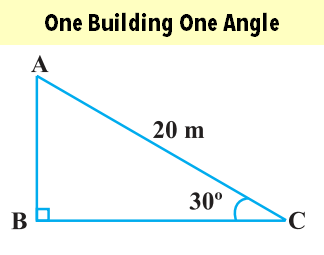 Starting the series of “Trigonometry –>Height and Distance(HnD)–> Five types of Questions. A man is 1.5 tall. He is 28.5 m away from a building. Angle of Elevation is 45. Find height of building. Instead of building, they can use different words like tree, telephone pole, building, tower, lighthouse,castle, mountain, hill, cliff etc. but the approach remains one and same. Plug in the standard value of TAN angle, using Topi-trianglesTM. That’s it, you got the answer. (in some cases, you’ll need to use SIN or COS instead of TAN). Watch the following video to see how ^this approach exactly works. And after watching the video, solve the mock questions given at the bottom of this article. An electrical pole is 5m long. An electrician needs to reach a point 2 meters below the top of this pole to repair the wiring. He uses a ladder, which makes an angle of elevation 60 degrees. Find the length of this ladder. String of a kite is 100 metres long and it makes an angle of 60° with the ground. Find the height at which the kite is flying. From a point on ground, the Angle of elevation of the top of a tower is 45 degrees. if the height of the tower is “A” and the distance between ground point and bottom of tower is “B”. then find relationship between “A” and “B”. (equal/ greater than/less than). Ratio of length of a building and its shadow is 1: root 3. Find angle of elevation of the sun. A ship is “a” meters away from the bottom of a 30 meter tall lighthouse. The angle of elevation is 60 degrees. Find the value of “a”. thanks sir……… trigonometry is headache for me…….. but now its fun..
@vivek and @vaishu- For question number 11..
sorry to point out about the answer of question no.-2 of the mock test. sir according to your short trick for finding trignomectric ratios of cos, sin,tan 30,60,45 degree in youtube video, the value of sin 30 is root 3 by 2 but the actual value is 1 by 2(ie 1/2). and so is for sin 60,cos 30, cos 60 angles. i think there is huge mistake in it…and the value of 30 and 60 degreee angle may br reveresed mistaknly..
got the answer sir…actually it was my mistake. i took value of sin thetha = adjusant/ hypotn. rather than taking it as sin thetha= opposite/hypotn. Sir can u plzz help me to solve the below question?? A house 15 metres high stands on one side of a park and from a point on the roof of the house, the angle of depression of the foot of a chimney is 30 degree and the angle of elevation of the top of the chimney from the foot of the house is 60 degree. what is the height of the chimney? what is the distance between the house and the chimney? =>y=45… this is height of chimney. ,,thank u very much sirr..
Sir help me to solve this question. An Electrician pylon stands on level ground. At a point 125m from the foot of the pylon the angle of elevation of the top of the pylon is 34 degrees. Find the height of the pylon and the angle of elevation of its mid-point of its height?